In the late 1980s Nirvana established itself as part of the Seattle grunge scene, releasing its first album Bleach for the independent record label Sub Pop in 1989. The band eventually came to develop a sound that relied on dynamic contrasts, often between quiet verses and loud, heavy choruses. After signing to major label DGC Records, Nirvana found unexpected success with "Smells Like Teen Spirit", the first single from the band's second album Nevermind (1991). Nirvana's sudden success widely popularized alternative rock as a whole, and as the band's frontman Cobain found himself referred to in the media as the "spokesman of a generation", with Nirvana being considered the "flagship band" of Generation X. Nirvana's third studio album In Utero (1993), challenged the group's audience, featuring an abrasive, less-mainstream sound. 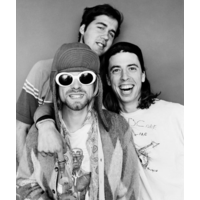 Nirvana's brief run ended following the suicide of Cobain in 1994, but various posthumous releases have been issued since, overseen by Novoselic, Grohl, and Cobain's widow Courtney Love. Since its debut, the band has sold over 25 million albums in the United States alone, and over 50 million worldwide.